Facebook friend requests have dried up, haven't they? Lately I've been getting fake ones almost exclusively. 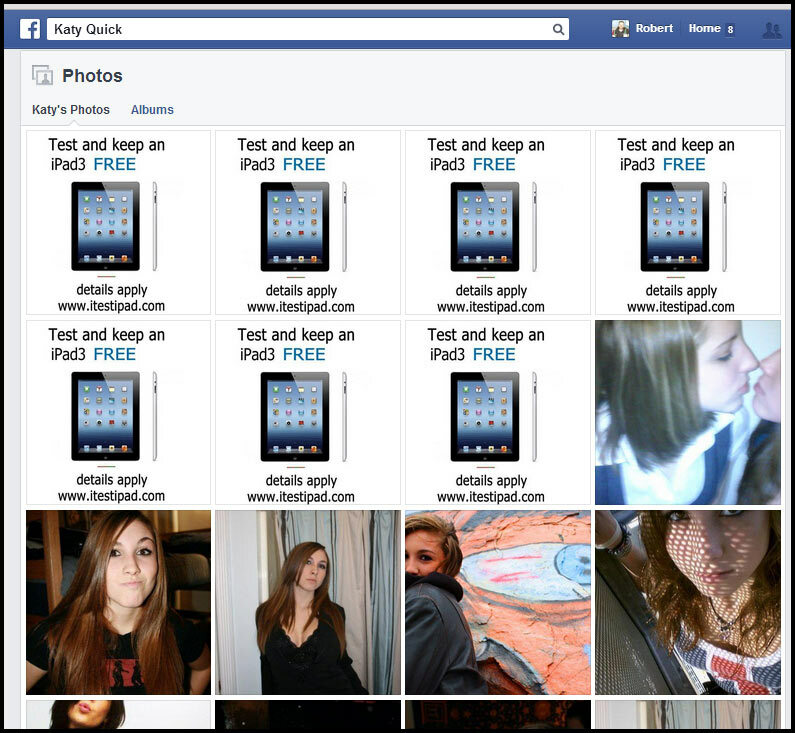 With the Google image search extension on Chrome, it has suddenly become pretty fun to investigate new friend requests. 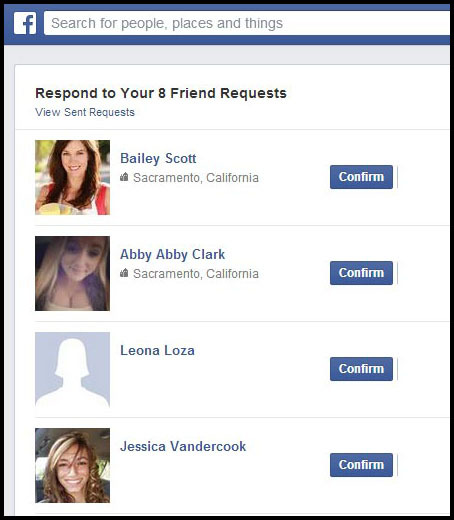 Here are four recent friend requests. They turned out to all be fake. This one, Bailey Scott, appeared to be from Sacramento. But no woman under 40 just joined Facebook this year. No way. 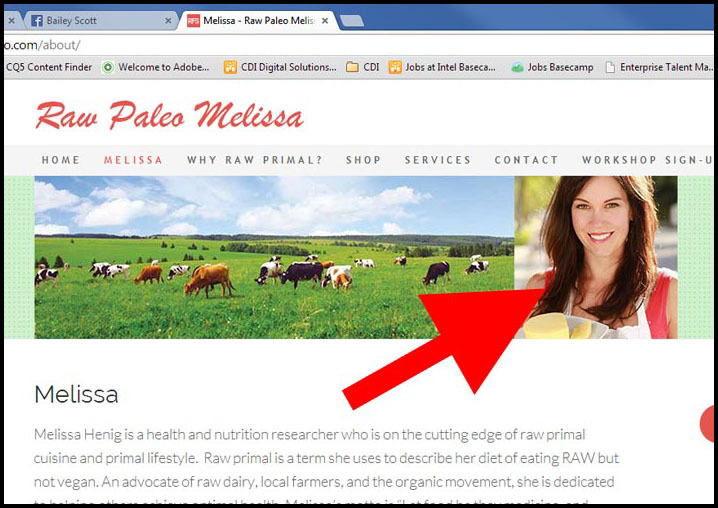 Sure enough, a Google image search revealed that this photo belongs to Melissa Henig, an advocate for raw cuisine and a primal lifestyle. 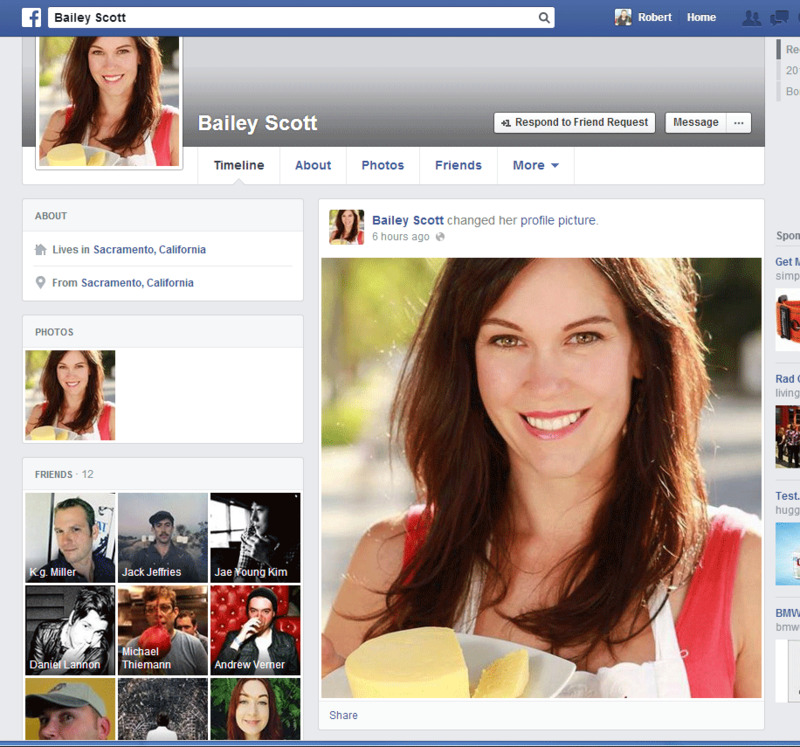 The photo for Bailey Scott was pulled from her website, Raw Paleo Melissa. A bunch of names came up using that same photo: Jennifer Porcelli, Cindy Cummings, Jessica Sauers, Jennifer Cozart. I searched Facebook. 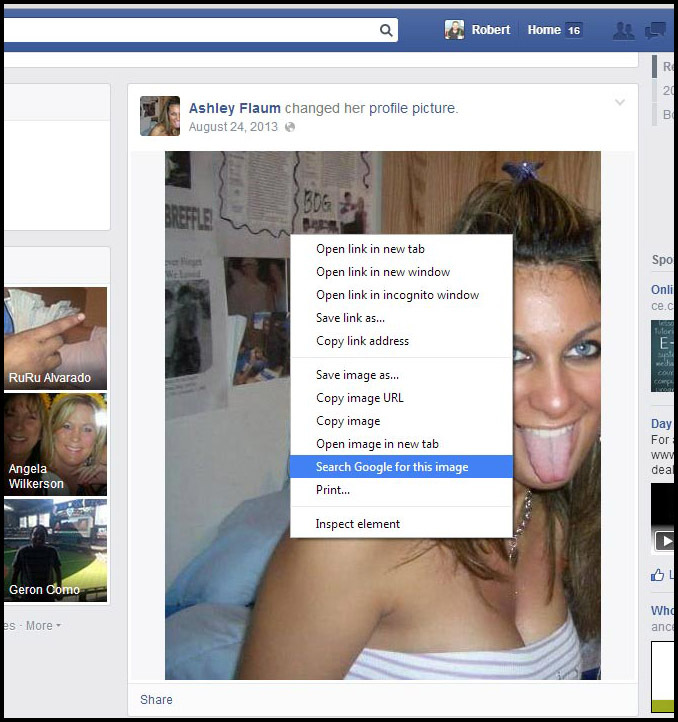 Jennifer Porcelli looks like a normal person, Cindy Cummings looks like a normal person, Jessica Sauers also had three friends and this profile picture, and Jennifer Cozart looks fake. 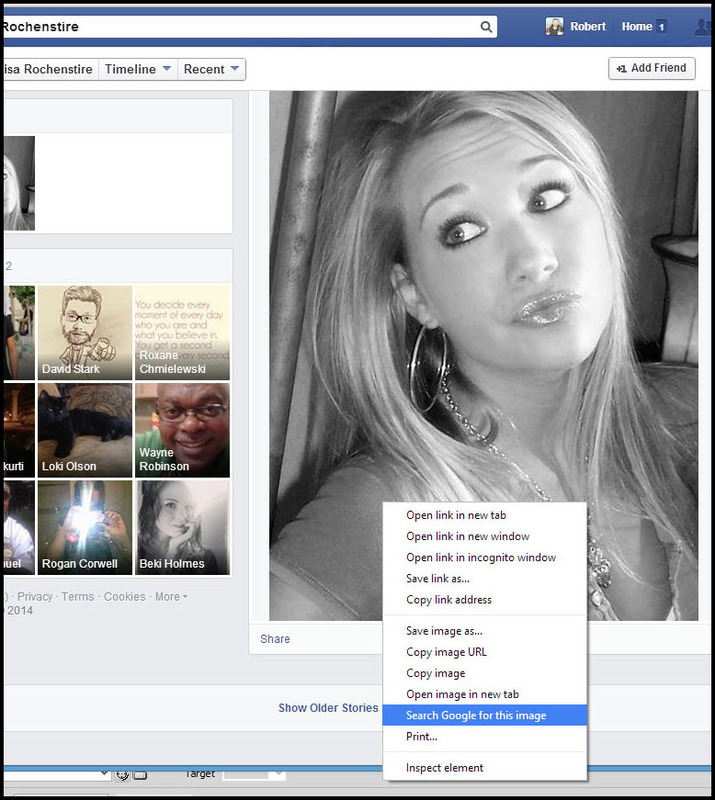 "Jennifer Cozart"s picture comes from a "Real Babes" thread on ebaumsworld.com, but she isn't Jennifer Cozart. She's also fake. 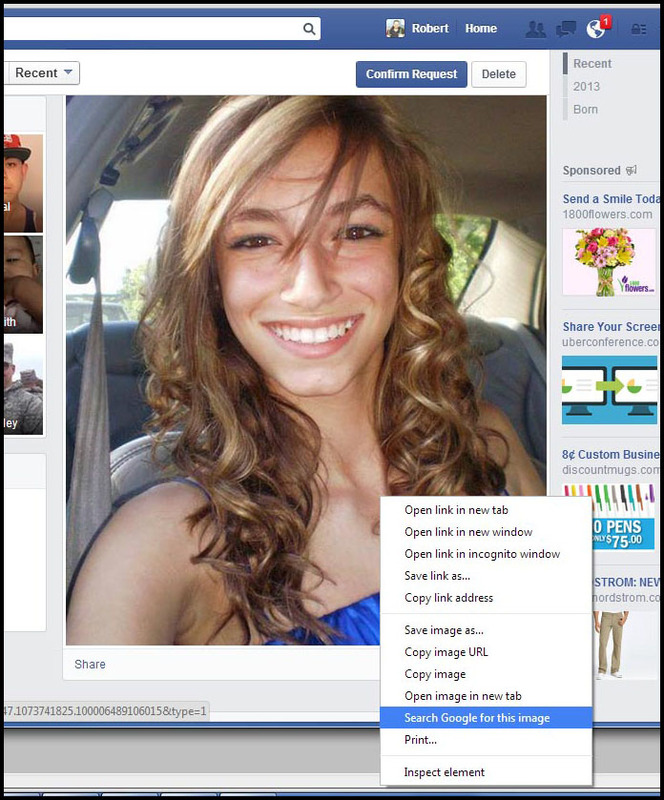 The next friend request comes from Leona Loza. She doesn't have a picture, but she wanted to tell be about her videos. I already know that fake names are surprisingly difficult to dream up. Good, real-sounding names are often re-used for several fake profiles. 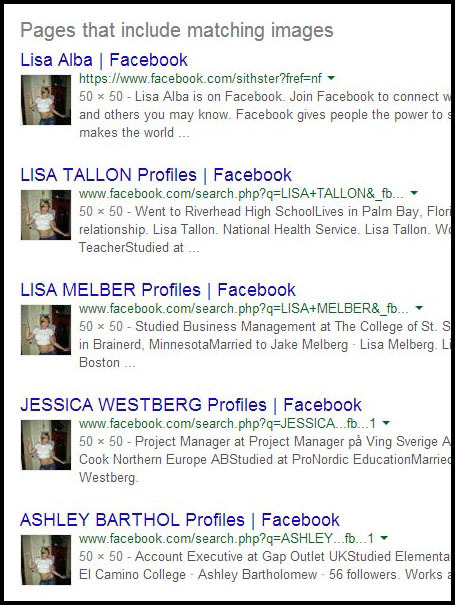 Above, Lisa Pettingill's name is used for two fake profiles. The first Lisa Pettingill's profile photo was taken from a Season 15 contestant on America's Next Top Model, Ana Mirdita. I don't know where the other Lisa Pettingill photo was from, but it was being used for a bunch of different profiles. After I found a list of names like the ones above, Jennifer Limeri, Jessica Laracuente, Lisa Klinkenberg, etc. I would do a search for that name and examine the most unlikely photos in the list. Here's a fake profile for someone named Ashley Bartholow. She is dressed up for halloween perhaps. 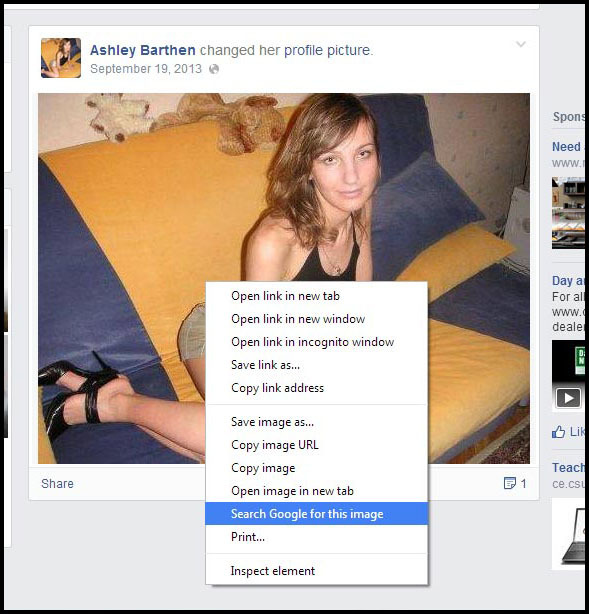 A search for her image reveals other profiles using that image. They could just have that image on them as a friend though. Can you spot the fake profiles? 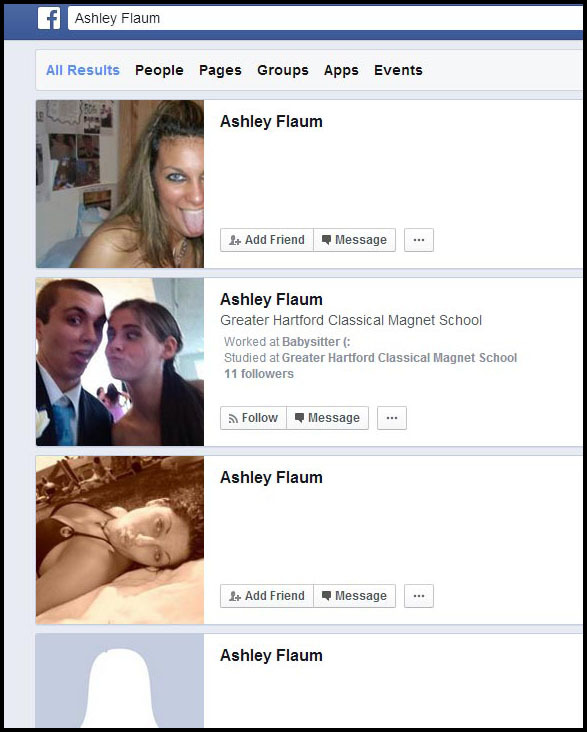 Consider the three profiles below for the name Ashley Flaum. That's right, the two sexist solo girls, the first and third Ashleys, are fake profiles. If you do an image search for her, you'll find that this Ashley has a bunch of other names. Unfortunately, this story doesn't have a satisfying end where I figure out who is responsible and bring them to justice. But I can tell you that Lisa Roche led me to Linda Laffey, who was unusual because she has an array of profile photos. And one of Linda Laffey's photos led me to Katy Mcguinness (male) and Katy Quick, two fake women who filled up their profiles with pictures advertising a scheme to test and earn ipads. 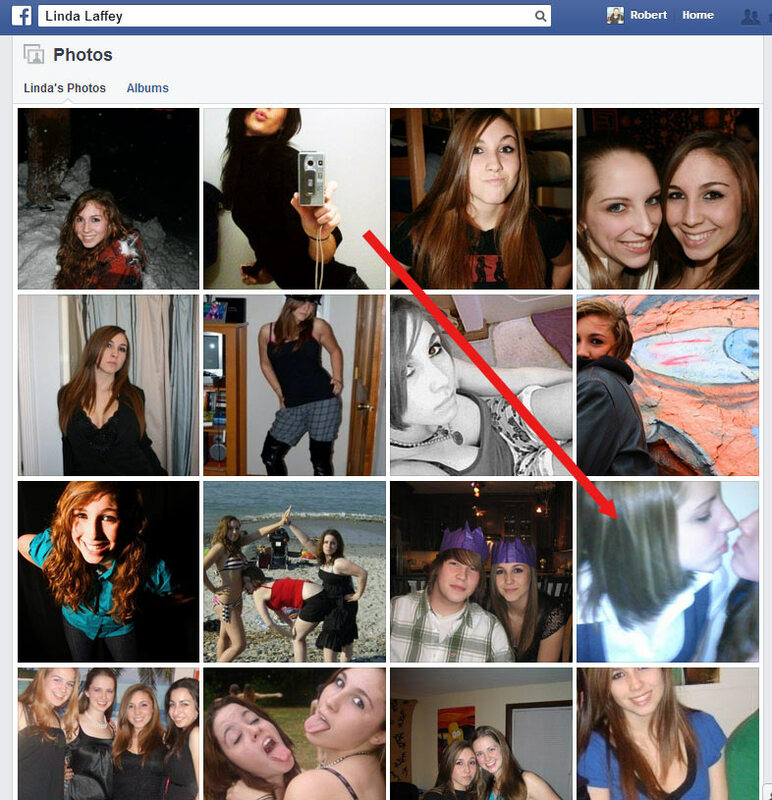 A fake profile is always an attractive woman. She has recently joined Facebook and usually has only posted one very good photo. She has about 11 friends. Don't befriend these phonies. It lends legitimacy to their profiles when they try to befriend your friends.